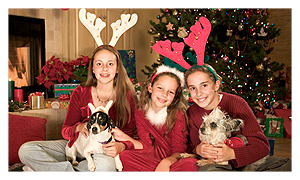 Kids need to remember there are many fun things going on during the holidays and you need to keep your pet safe. Your house may have decorations, plants and foods that usually aren't around the rest of the year. Some of these holiday items can be dangerous for your pets and you can help protect them. Cats love to play with shiny tinsel and ribbon. However if swallowed, tinsel can get tangled in cat's stomachs and make them very sick. If you have a cat, don’t decorate with tinsel and pick up the ribbons after gifts are unwrapped. People like having holiday plants around the house, like poinsettias, holly or mistletoe. Most pets ignore them, but these holiday plants can make animals sick. If you see your pet eating one of these plants, call a veterinarian to find out what to do. During the holidays, you may get small toys or toys that have small pieces. Dogs and cats are curious. They like to put things in their mouths. They don’t know that this can be dangerous. Remember to put your toys away when you are finished playing. You may want to give your pets some table scraps from the holiday meal, but when animals eat fatty foods, it can make their stomachs upset. It's best to only feed them pet food. Dogs love turkey, chicken and steak bones, but they can be sharp and cause cuts inside a dog’s stomach. Make sure bones go in the garbage and not in your dog. Did you know chocolate and some sugar-free mints and gum can make dogs very sick? Don’t leave candy where dogs can get it. If your pet eats chocolate, sugar-free mints, or gum, you may have to call a veterinarian. It's fun to give your pet treats for a stocking stuffer, but even pet treats can cause problems for animals. Some treats can get stuck in a dog or cat’s throat. Too many treats may make them sick. If you want to give your pet a treat, keep the treats small and don’t give them too many at once. Dogs and cats have fur to keep them warm, however left outside in the cold without shelter, can be dangerous. On days when it's very cold, make sure your pet is safe and warm.